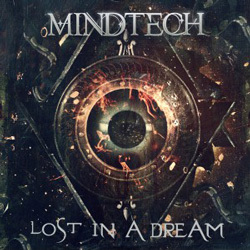 Just a one-track download from Norwegian power metallers Mindtech, but what a track! If you’re really going to make an entrance, you want to get noticed, and ‘Lost In A Dream’ is the perfect ‘comeback’ for the band who’ve been MIA since the release of their debut album ‘Elements Of Warfare’ almost two years ago. The album’s launch party, it seems, also marked the exit of vocalist Aslak Johnsen, and finding a replacement took up most of 2014. After a false start or two – but using the downtime to continue writing material – the ’techies (guitarists Thor-Axel Eriksen and Marius Belseth, bassist Ola Øverli and drummer Ole Devold) recruited Mathias Molund Indergård, who’d cut his teeth in Priest and Maiden tribute bands: never a bad way to develop your vocal style. Wasting little time the new line-up went into the studios, and ‘Lost In A Dream’ is a taster for a new six-track EP due for release next month. And if this is a hint of what’s to come, then things are looking very promising indeed for the band. Heavy, dynamic and as forceful as a bunch of bailiffs knocking at the door ‘Lost In A Dream’ is an exciting and powerful slice of metal with some extremely slick guitar work and exquisite pitch-perfect vocals from Indergård, a singer who seems to possess an almost impossibly-unlimited range. Every time he relinquishes the mic Eriksen and Belseth take centre stage and have a little six-string fun, and Øverli and Devold not only keep the whole thing on track but forever drive it onwards. It’s a fabulous song, and if there’s a downside it’s just that at four-and-a-half minutes ‘Lost In A Dream’ is just too damn short: I could listen to this all day and never get bored. As I said, there’s an EP on the horizon; should be well worth watching out for.